Most of the images that currently appear on this website were scanned from originals in the Smithsonian’s National Anthropological Archives. Over 700 images have been selected because they can be definitively identified as 1926 expedition photographs. These have been sorted into 25 location/subject categories. An editorial selection of seventy-seven of these images have been inserted into Matthew Stirling’s expedition journal, along with a quotation from the journal relating the image to the text. There are up to 5 possible kinds of photo captions included here for each image, in addition to the quotation from Stirling’s expedition journal. (See Caption details) This organization of the photographs and their captions should make it possible to integrate, within this framework, photographs from this expedition found in many other archives or collections. 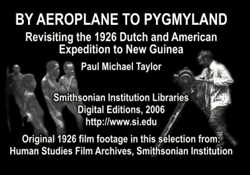 The film footage has been edited and digitized from a beta-cam copy of film footage located in the Smithsonian’s Human Studies Film Archive: OC-87.4.1: [“Stirling New Guinea Expedition, 1926-1927”]. This footage (which did not constitute a finished version of the film shown on Stirling’s 1927 lecture tour) was narrated many years later (probably in the 1960s) by Matthew Stirling. The footage runs approximately 2 hours and has here been divided into selections (1 to 30). Viewers may download the film selections in either Quicktime (low or high res) or Windows Media. The “Description” provided here for each film selection is a transcription of the text that appeared in this original film, as text (intertitles) between sections of film footage. (See Interpretative Essay 2 for more details on the Film Footage and Photographs).